Here is my post about going Bangkok with my best friend D. He is the tour guy for this trip because he has been there for few times. Airasia moved its flight operation from Suvarnabhumi to Don Muang Airport by Oct 1st 2012. It was not convenient to us anymore because D said there was no MRT station in Don Muang that can take us directly to our hotel in Silom. He was right. Our trip fell on Oct 4th to 7th (4D3N), Thursday to Sunday. By the time we arrived in Don Muang Airport (DMK) was about 1pm local time. At 1:30pm we already in the queue for taxi. 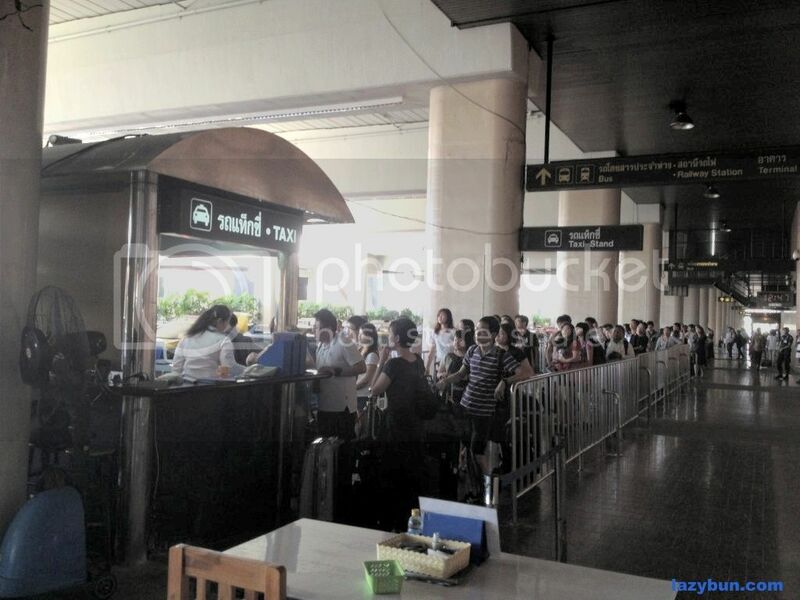 This photo will show you how it looks right after your arrival in Don Muang & looking for taxi. I have to say it is really much systematic than any airport in Malaysia. Big thumb's up! Long queue but efficiency. See below photo for the reason why I said efficiency. It just never ends. The queue was fast & in no time you will be on the road heading to your destination. The journey took about 30-40 minutes to reach I-Residence Hotel Silom (RM 520 via Agoda.com), passed through 2 tolls which cost 105 Baht (only for the tolls. I didn't remember the taxi fare we bought from airport). My impression on Bangkok instantly changed (slightly) during the taxi drive. Not bad and even better than KL I must say (do you think so?). We starting to look for local SIM card for iPhone after we've checked in hotel. It was funny at first we couldn't find any 7-eleven that sells SIM card package for tourist and they don't even speak simple English. I was stunned. I thought Bangkok is the city where most population are actually tourist (exaggerated). So why the local even the staff in 7-eleven don't speak English? After almost 1 hour of hunting for 7-eleven outlet, we finally got our SIM card. 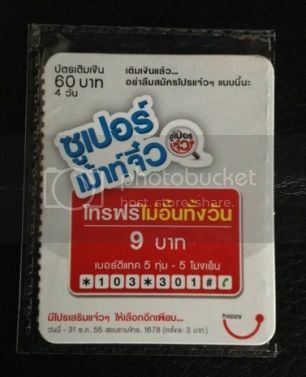 Happy Tourist sim is the name of the package which cost 49 Baht. It gave free unlimited Internet access on 3G/EDGE on the first day. 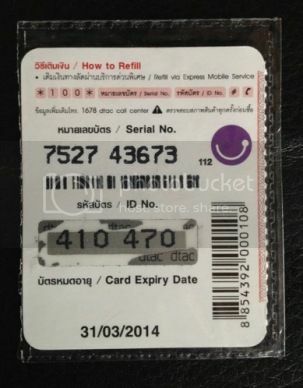 Then you have to buy refill/top-up from 7-eleven outlet in case you're out of credit. We didn't do homework on this. So I gonna make sure its smooth to get SIM card for next Bangkok trip. Happy Tourist. Luckily it is micro SIM cos we both use iPhone. Refill/Top-up coupon from 7-eleven. 4cm x 5cm size. I'm not sure how much is this coupon. My brain just can't remember anything. It's easy to top-up. Just follow the instruction code from card behind. We were sweating under the hot sun in the afternoon. Probably because of hunting 7-eleven outlets. We stopped by a small Starbucks cafe just to cool down and enjoying coffee. 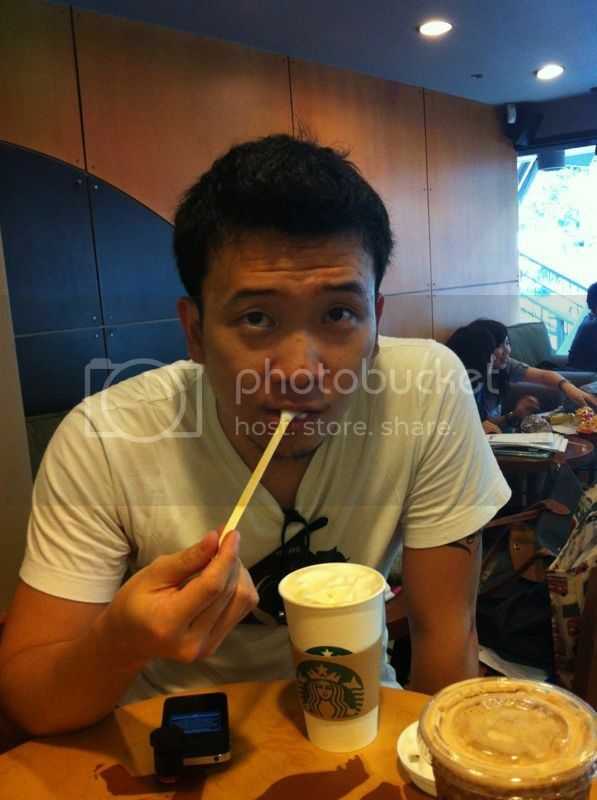 It was like a relax chat back in KL we used to hanging out in Starbucks Tropicana mall. We didn't have itinerary for visiting tourist spot like Temple of Dawn (Wat Arun), Floating Markets and etc, simply because what we wanted to do was just a relaxing hangout & shopping. Sweating all over. Testing coffee & my local SIM card. 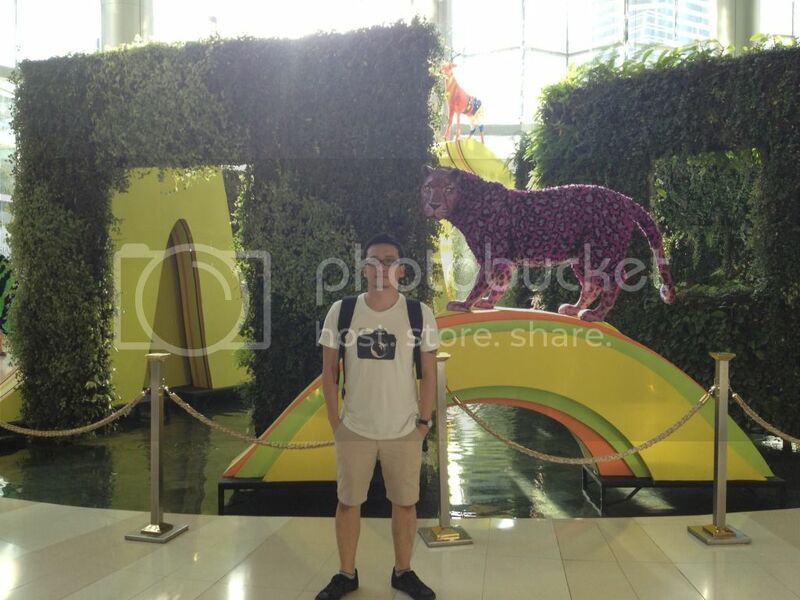 Siam Paragon mall. Don't be fooled by the exterior but please check out the interior. You'll love it. 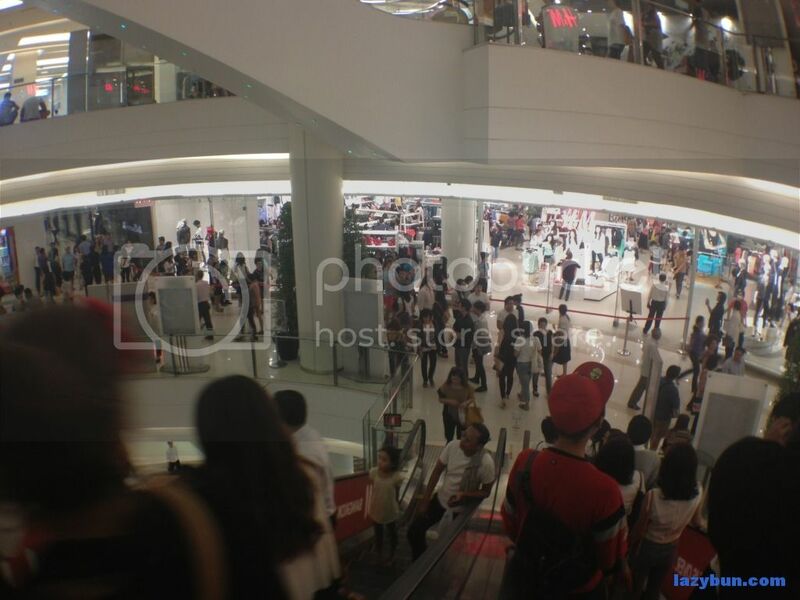 Siam Paragon entrance view. Spacious right? Click the photo for enlarge view. Photo taken with iPhone 4S iOS 6's panorama feature. 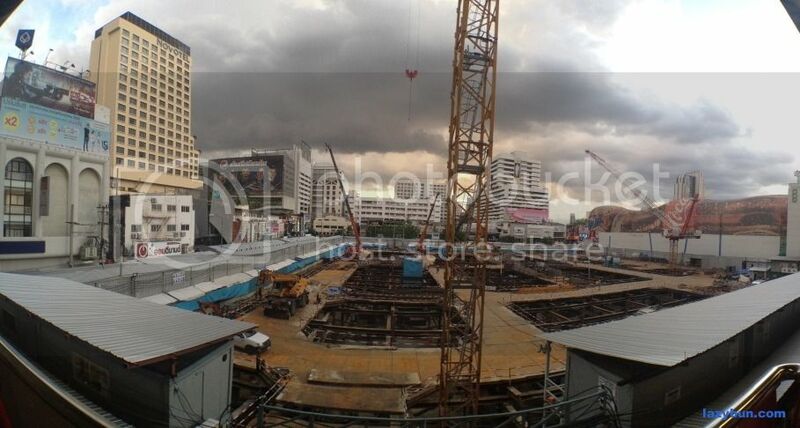 Construction opposite Siam Paragon. 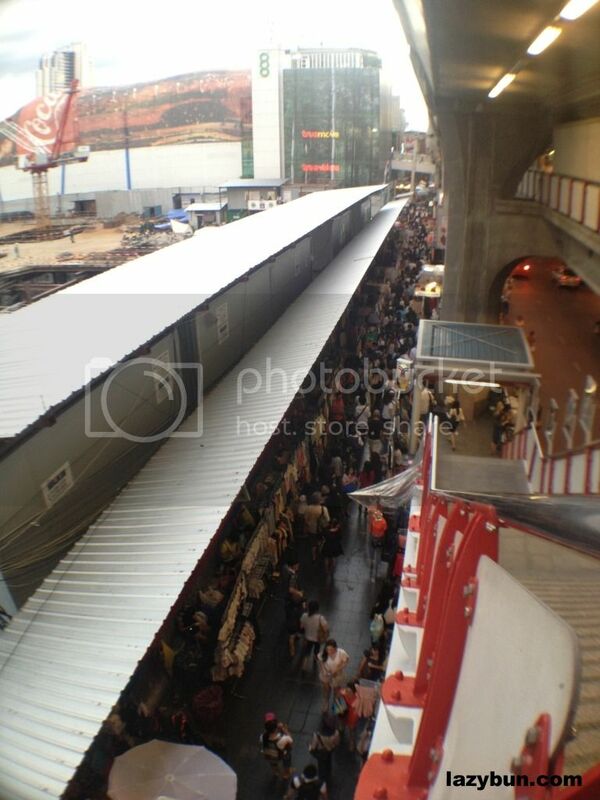 Photo taken from BTS Siam station. The stalls line up all the way down to another mall. Bangkok is full of market stalls. 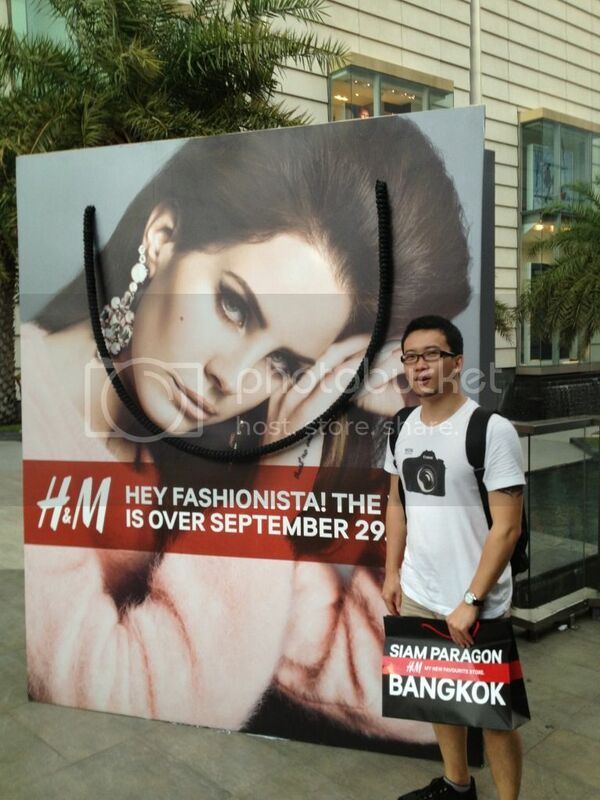 Typical photo taken at Siam Paragon entrance. H&M just opened in Siam Paragon. It is huge & I love it more than any H&M outlets in Malaysia. We went round and round just to check out the shops. I wanted to buy high cut leather shoes all this while so I thought I could buy it in Bangkok because it might be cheaper here but I couldn't find it. I don't think any thing from Siam Paragon mall is cheap though. Hahaha. By the way I bought two slacks from H&M. Happy Shopping on the 1st day! Around 6pm we went back to hotel for dinner. Instead of trying the cafe in I-Residence Hotel, we stepped in opposite hotel, Heritage Hotel for dinner. The reason was the opposite cafe looked more classy than the one in I-Residence hotel. Kakaka. It was about to rain in this evening and peak-hour traffic jam after office hour. It looked worse than KL traffic though. Spicy pork with rice & Chang beer. 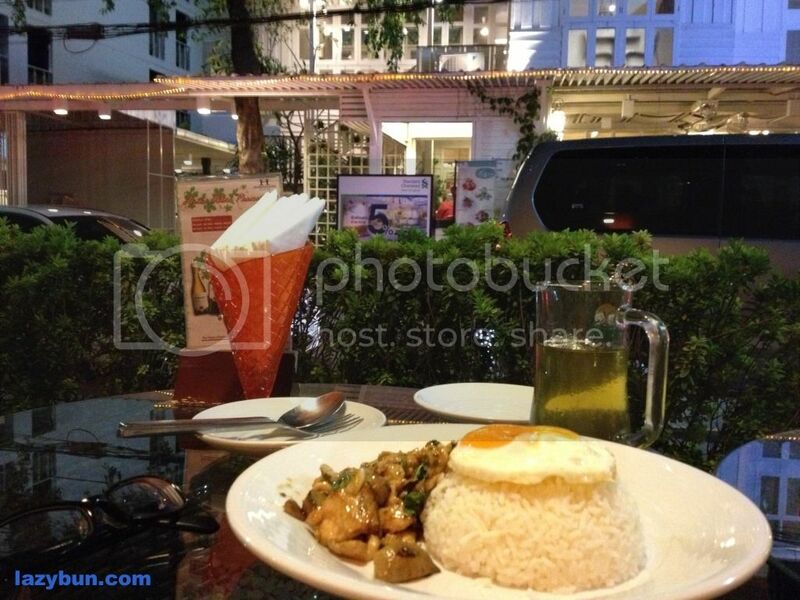 We had 4 Chang beers (local), fried rice with prawns & spicy pork with rice, total bill was 740 Baht. At night we didn't go anywhere because of the rain and its time to charge our cell phones. It was a boom! We didn't bring our universal adapter! The hotel doesn't have the universal adapter to rent to hotel guest. For Chris sake! After the rain stop, I went out to hunt for universal adapter with hope that 7-eleven might have it. I searched nearby two 7-eleven outlets and they didn't have it! Grrr...! Fortunately we found it in the 3rd nearest 7-eleven (not quite remember was it 7-eleven but I remembered it was bigger & more things in the store) after I came back & told D we had problem! Kekeke. Then we took turn to charge our cell phones. Such a relief. 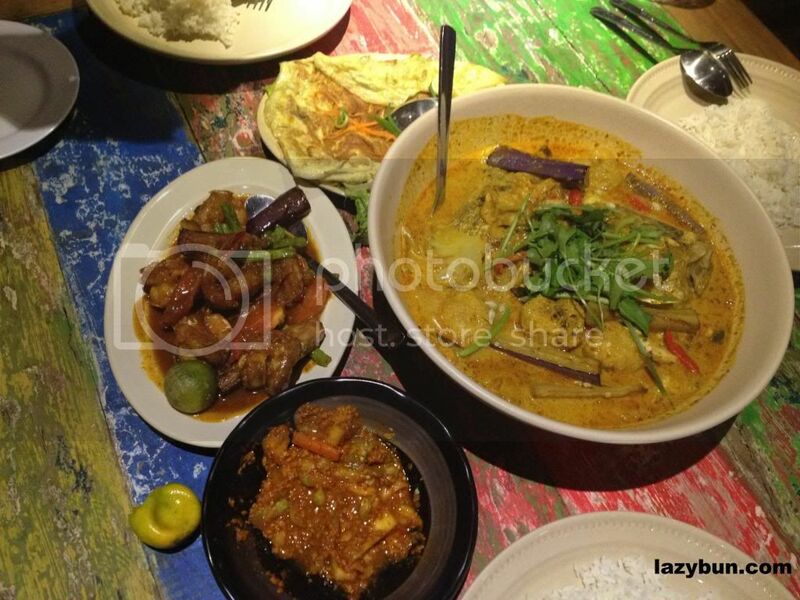 Last night dinner was in The Bird restaurant at Publika. The reason is a good friend had time for dinner with us. 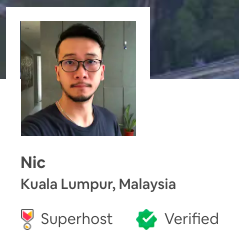 Since my partner got The Bird promotion voucher from Groupon, we thought this would be a great opportunity to use it and we did. With more people on the table, we could have more variety from the offer menu. 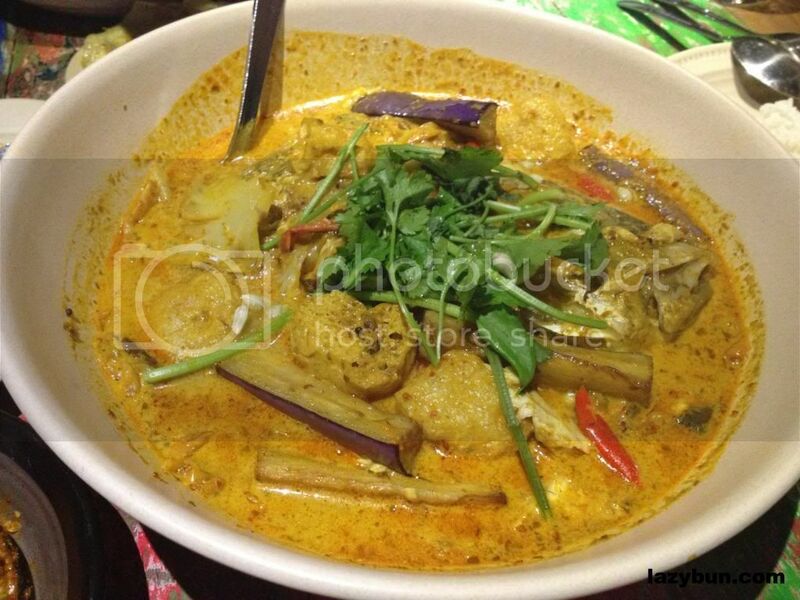 The food was good as always, as well as dining with friend. We requested for it to be moderate spicy. Two fish heads were finished by our friend, Stanley. The rest of fresh done by us. We love it. 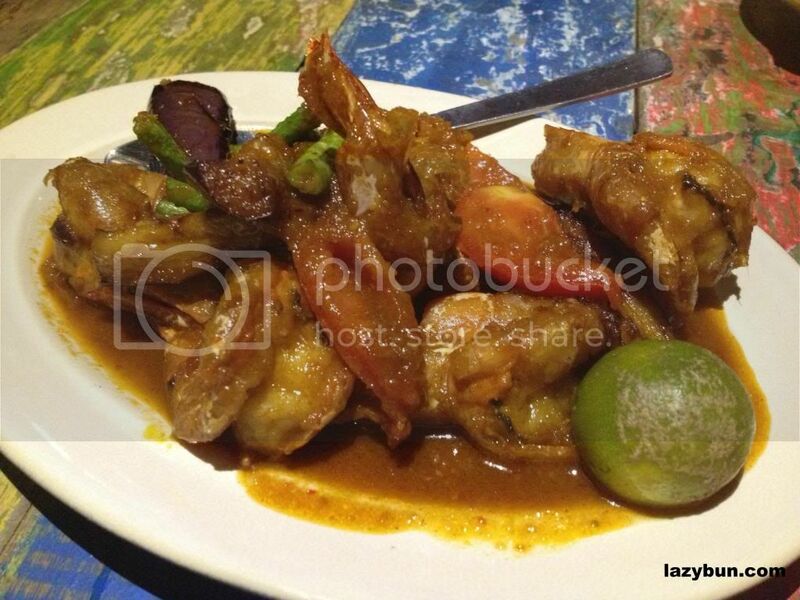 It was about 6 prawns and the curry gravy was yummy. 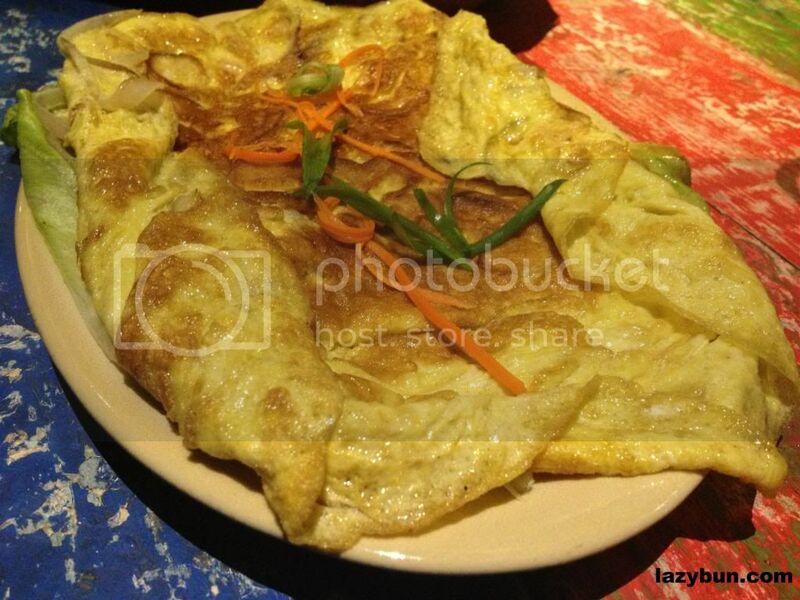 This is more than enough for 3 person. Yummy. Great dinner with great friend.